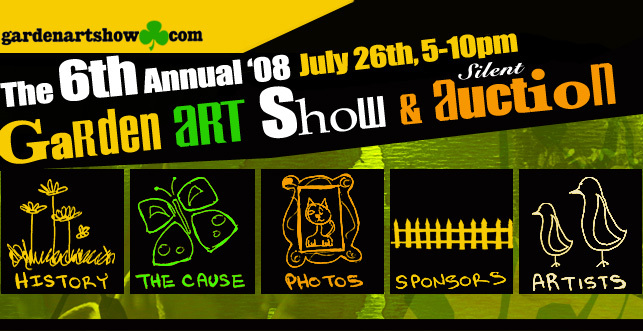 Proceeds from the 2008 Garden Art Show primarily benefitted the Thorne Ecological Institute in Boulder, Colorado. Founded in 1954, Thorne Ecological Institute builds Earth stewardship by connecting kids to nature through hands-on environmental education. The Institute's Natural Science School has connected over 30,000 kids to nature. Experienced teachers lead enthusiastic kids outside to explore the wonders of Colorado's Front Range. PLUS: we are sponsoring a woman survivor of war through womenforwomen.org. Women for Women International provides women survivors of war, civil strife and other conflicts with the tools and resources to move from crisis and poverty to stability and self-sufficiency, thereby promoting viable civil societies.